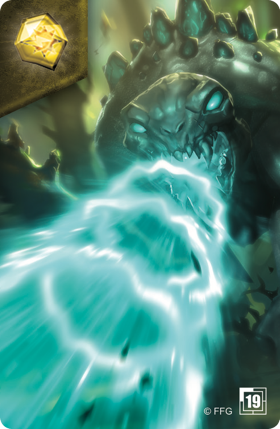 Portals to the Crucible have opened all over the globe, and KeyForge players have already discovered hundreds of thousands of unique Archons—each of which has set forth on a quest to gather as much Æmber as possible. Why? Because they want to forge keys and unlock the Crucible's countless hidden Vaults. 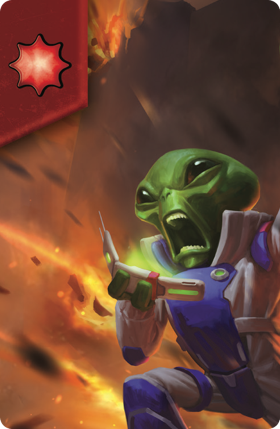 Exploration, discovery—and, yes, conflict—lie at the heart of the KeyForge experience as players send their Archons to battle for the Vaults they uncover. 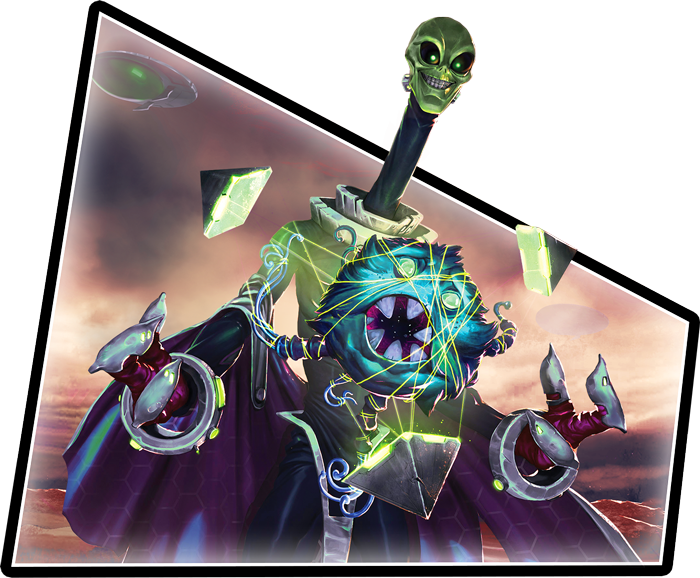 Each new game is a chance to meet another of the game's unique Archons and to learn more about your own Archon's personality, card combinations, and play style. Each new game is another chance to test an Archon you haven't yet played or which you've recently realized has more potential than you first thought. 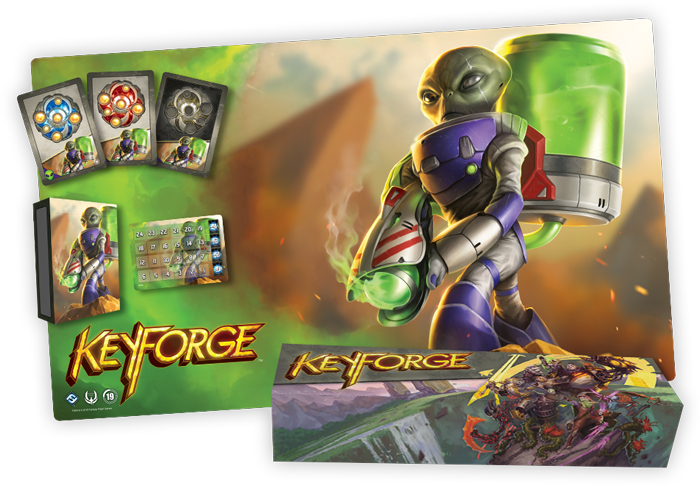 Most importantly, each new game of KeyForge is another chance to enjoy the game's fun and wild themes, its lightning-quick gameplay, and the time it allows you to spend with new friends. Maybe you want to test your mettle in a tournament. Maybe you don't. Either way, you'll find KeyForge Organized Play has got you covered. There's a whole Crucible of Æmber and Vaults just waiting to be discovered, and KeyForge Organized Play is ready to reward your exploration with new prizes. By now, you may have already heard about the ChainBound tournaments where you can load your account in the Master Vault with valuable Æmbershards. But while these events are undoubtedly exciting for players looking to explore the game's more competitive aspects, they may not appeal to everyone. Perhaps you're just learning the game and not yet interested in the idea of a tournament. Perhaps you want to meet for a game or two, but don't have time for a full tournament. Or perhaps you want to try out a number of different Archons to learn which pleases you most. Well, okay—the new structure for Open Play Nights has got you covered! Show up to the store. At Open Play Nights, you just play the game however you were going to play it anyway, but because you're playing at your favorite local game store, you can record your games and earn alternate art cards. 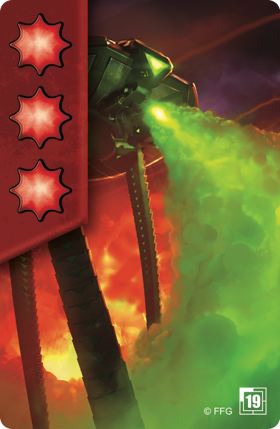 There are three different double-sided alternate art cards in the 2019 Season One Kit—one for each month the kit supports—and each game you play in the store earns you a check mark on the store's tracking sheet. 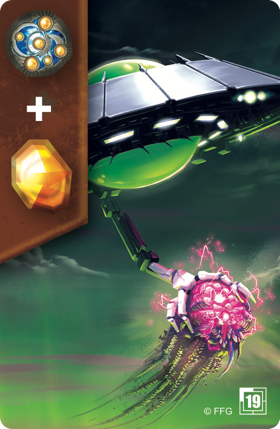 Each time you complete a full bar of three games, you earn a copy of the month's alternate art card. Now, if you're feeling ambitious, you can choose to race through twelve games in a single night and earn all four copies of the month's alternate art card. But you don't have to! You can play at your own pace. You can play all your games with one Archon deck or use a different deck for each game. You can play all your games against the same opponent, or you can offer demos to twelve different people coming in from the street to learn about the game. And if you play in a tournament? Well, those games count, too! Just get them recorded! How you play your games is totally up to you. You just need to play them in the store and have a store representative record your games on their tracking sheet. And what are the 2019 Season One cards? They've already been revealed in the Master Vault's Prize Gallery, but they may yet merit some review here, as well. 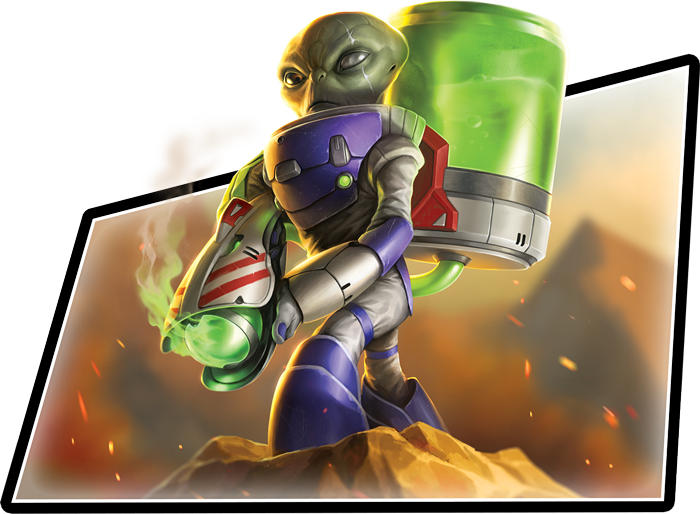 After all, these cards offer you an alternative to the game's tokens, and as official Organized Play products, they're legal for tournament play. 1 One Æmber or key cost increased by one Æmber. 2 One damage or three damage. So… we've got ChainBound events and Seasonal Kits to support your Open Play Nights. But if you're like one of those Shadows thieves who just can't resist a gleaming pile of Æmber—and you're always looking for even more KeyForge—you'll want to find a retailer that's using the 2019 Season One Premium Kit to support its Open Play Nights or to run a special tournament. 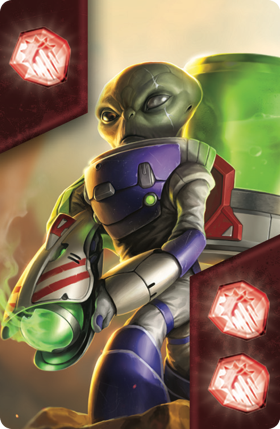 The Season One Premium Kit introduces a range of Mars-themed prizes that can reward as many as sixteen participants in a tournament or that can be distributed as additional rewards for your favorite local game store's Open Play program. *An extra copy of each of these items has been included for the Tournament Organizer to keep or distribute at his or her discretion. How Does All of This Fit in with ChainBound Events? In the greater KeyForge ecology, ChainBound tournaments are a special case, because of how they reward Æmbershards and link your participation in local events to the prizes available at those KeyForge events that feature Prize Walls. And, accordingly, it is the digital end of these ChainBound tournaments that define them. That said, they are—in the end—just another form of KeyForge tournament that your local retailer can run. Just like the tournament your favorite local game store might support with a Seasonal Premium Kit and the alternate art cards from the 2019 Season One Kit. 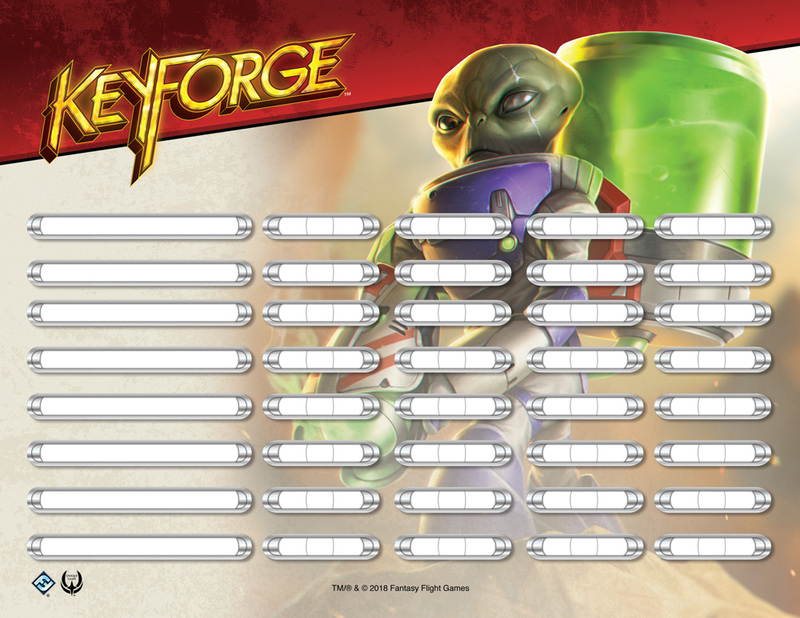 This means your favorite local game store will have plenty of flexibility to structure its own KeyForge program. It can host casual Open Play Nights. It can host demos and award Season One Kit promos as rewards to everyone who attends. It can host tournaments and reward the Season One Kit promos. It can offer its Seasonal Premium Kit contents to its most dedicated Open Play participants or use them to support one or more tournaments. It can even explore the mixture of options that best suits you—and the other members of your local KeyForge community. 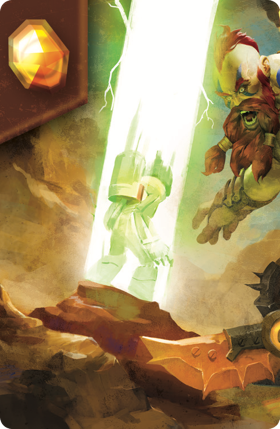 Exploration and discovery lie deep in the heart of KeyForge, and just as you explore your decks and the options they bring to play, so will your favorite local retailer be able to explore all the various ways it can use the kits, their contents, and the game's diverse assortment of formats and variants. In the end, you'll find the Crucible come to life at your favorite game store. Its walls will glisten with shards of Æmber. You'll find Archons racing to unlock newly discovered Vaults. And you'll find your participation in Organized Play rewarded by an assortment of prizes so rich and immense that no single Vault can long contain them!